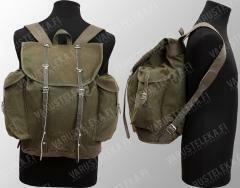 An older version of our best-selling medium sized rucksack. Almost as good as the newer, and way more retro. These are getting rarer by the shipment. A word on availability: these come in small numbers and are sold in equally small amount of minutes. If you want yours, request and e-mail notification and be prepared to act immediately. We don't take pre-orders on surplus, because we can't promise availability. 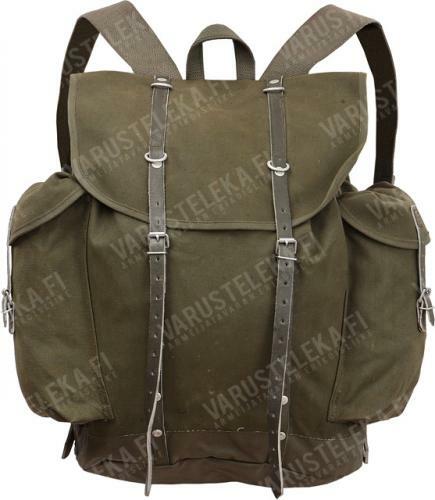 Like the modern classic BW rucksack, this older model essentially serves the same purpose, but with more stylish and old fashioned materials and buckles. This means thick canvas, leather and metal. The shoulder straps are strong canvas, not padded and can be released from the bottom. Admittedly, the newer model is a bit more practical with the fancy plastic buckles and all, but it definitely does not have the retro-style of the old model. And hey, this still isn't a bad rucksack. In fact it's one of the better old school packs we've seen. 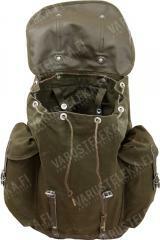 Volume about 30-35 litres, extreme measurements 48 x 45 x 23 cm, width without side pockets 30 cm. Made in West-Germany. Used but in perfectly serviceable condition.